Our final article in the Half Dozen Hello Worlds will introduce you to activities. What is an activity? It is a single screen that a user interacts with on their Android device. You’ve actually been using activities throughout these tutorials, we just haven’t examined them. 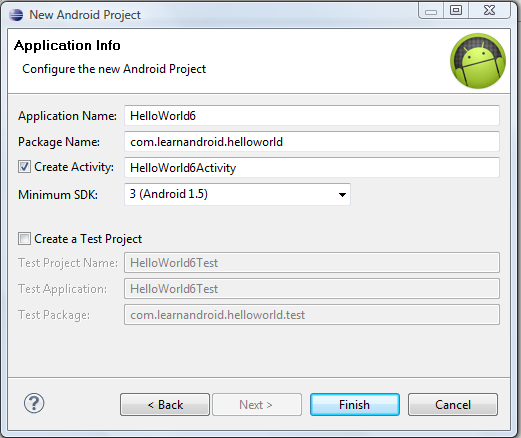 First, let’s create a new Android Project. Since we are discussing Activities, you should notice that we are importing android.app.Activity. You should also note that our class is extending Activity. This gives us basic functionality to present our screen to the user without much work on our part. There are other classes we can use, that also inherit from Activity to provide us different functionality. In this article we used a ListActivity to present a list to the user. In fact, let’s go ahead and make the changes described in that article to our code. You might have noticed that I named the items on my list “Hello 1” and “Hello 2”. That’s because we are going to use Intents to call the programs we created in Part 1 and Part 2 of this series.